Looking for a cheap Smart TV? Here you'll find the latest deals and discounts shared by our community of bargain hunters. "Smart TV" as term is a little redundant now, as all new TVs are smart - in the sense that they connect to the internet, have apps such as Netflix and Amazon Video, and are capable of a bit of web browsing. Brands such as Hisense, Samsung, LG and more are available from a range of retailers. You may also want to take a look at our Black Friday deals when many big price drops happen. Smart TV is a TV set with wide range of modern features such as integrated internet and interactive Web 2.0. Aside from gaining access to streaming services, you will be able to connect to different wireless devices like your smartphones. Smart TV is different from IPTV, Web TV and Internet TV as its operating system is available via a set-top box or preloaded. Users can also install or update on-demand apps through an app marketplace or app store just like with smartphones. External devices are also incorporated to Smart TVs such as game consoles, Blu-ray players, smartphones and more network-connected interactive devices that uses television-type display outputs. Users can find and play videos, movies, TV shows, photos and other content from the Web, satellite TV or cable or from their storage devices through these devices. You can get a lot from your TVs through the features of Smart TVs. Almost all ne TVs today are now smart that comes in a wide array of models that buyers can choose from at really affordable prices. Here at Latest Deals, you can find the best possible Smart TV deals online shared and posted by our community of bargain hunters. We have deals, offers and vouchers from big retailers like Asda, Argos, Currys and Sainsbury’s. 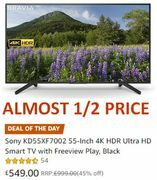 Where can I find cheap Smart TV deals? Big UK retailers offer great deals across a wide range of Smart TV of all sizes across all brands ensuring you will have the best TV at the best price. Make sure to browse through the offers our bargain hunters have posted to take advantage of amazing savings you can get both online and in-store. Currys always have great Smart TV deals on their website. They offer massive savings ranging from £180 to £500 on select brands and models. They also offer free deliver and collection from store. Some of their deals also comes bundled with other offers. For example, you can get a £100 off the marked price on the Xbox One X and claim up to £200 cashback when you buy the LG 49” or Samsung 55” Smart TV. You can also get big savings across their product ranges during Black Friday. You can get a Smart TV 32 inch at Argos for just £199. You can also get savings with Argos TV sale on new Full-HD models ranging from £5 to £30. Make sure to lookout for products marked with “Wow Great Price” as this indicates their lowest price on that particular item. You can embrace the modern face of entertainment with Tesco’s selection of Smart TV. You can choose from top brands like Sony and Samsung with free delivery. Get savings ranging from £20 to £80 and earn Clubcard points for your purchase. They also have special offers on select models such as getting discounts 20% on selected Sharp TVs, £50 off on select Bluray players and £20 off on select soundbars. Aside from this they also have bundle offers that you can take advantage for if you’re looking to level up your home entertainment. Browse through a selection of Smart TV at Asda ranging in size from 32” to 65”. They have great offers for Polaroid with massive savings ranging from £169 to £199! A 32 inch TV Asda deal starts at £159 with delivery for just £2.95. If you’re looking for Smart TV accessories, Sainsbury’s TV accessories includes offers on wall mounts where you can get £15 savings as well as nice discounts on a select cables, DVD players, antennas and universal TV remote controls. Smart TVs come with either pre-loaded apps or you can download them from the app store. Most also offer movie and TV streaming services such as Amazon and Netflix. Almost all Smart TV models features a built-in web browser which lets you browse the net, view sites, videos and photos while sitting comfortably on your couch. There are also brands that provides extra services like customizable home screens and recommendations of what to watch basing it on your own tastes. Newer models have also added voice assistants like Google Home for LG and Amazon’s Alexa on the Hisense and Westinghouse. Do Smart TVs crash or hang? Unfortunately they do. Smart TVs come with computer chips in order to juggle video processing, internet connection, multiple screen and upscaling. They also use memory in order to buffer streaming of music and video as well as require more processing power to deal with graphics. But they are getting better processors these days that can handle multitasking. Usually turning it on off will resolve the problem. Do Smart TVs have better quality picture? Not really. Its built-in Wi-Fi and processor which decompress videos does not affect the picture’s quality directly. But since manufacturers initially added features to high-end more expensive HDTVs, buyers may find that the quality of pictures on some Smart TVs are far better than those of lower-priced models. How can I find a cheap soundbar?